Railroad Sunset - the boundless horizon, with its owing strata of red-orange, purple, gold, and blue, suggests an American landscape unmarked by human achievement or failure, save for the solitary presence of the switching tower standing watch beside the railroad tracks. A powerful, uneasy current of pale green breaks the dark grassy plain of Hopper's schematized prairie, sending an undulating shiver through its darkly stolid depths. An electric glow fills the tower with a momentary greenish refraction of the coarse window glass. 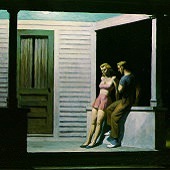 In the hands of another artist, even the younger Hopper, the railroad might have yielded a bustling genre scene full of excitement and anticipation of adventure, reunion, or tearful farewell. 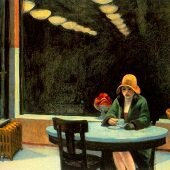 The mature Hopper is drawn into the highly charged, unsentimental heart of the American landscape as he contemplates the character of journeys in physical space and perceived time. 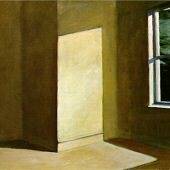 Although Hopper's equation of pictorial space, physical landscape, travel, and spiritual adventure recalls the expansive vistas imagined by the Hudson River School painters of the nineteenth century, his vision is fundamentally different from theirs. 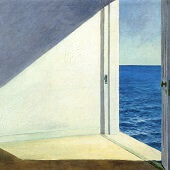 Neither a romantic traveler nor a believer in manifest destiny, national or personal, Hopper ponders plainer private truths to be discovered in voyages. 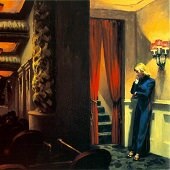 He admits commonplaces such as fatigue, boredom, uncertainty, and disappointment. 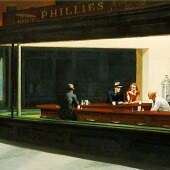 The grand pieties of the Hudson River School recede beside Hopper's sober intimations of the harsh yet, mutable realities of twentieth-century life. His is the high road of extraordinary candor; it is a poetry that finds a kindred voice in our most intimate, often bittersweet realizations of the sameness of much personal experience. 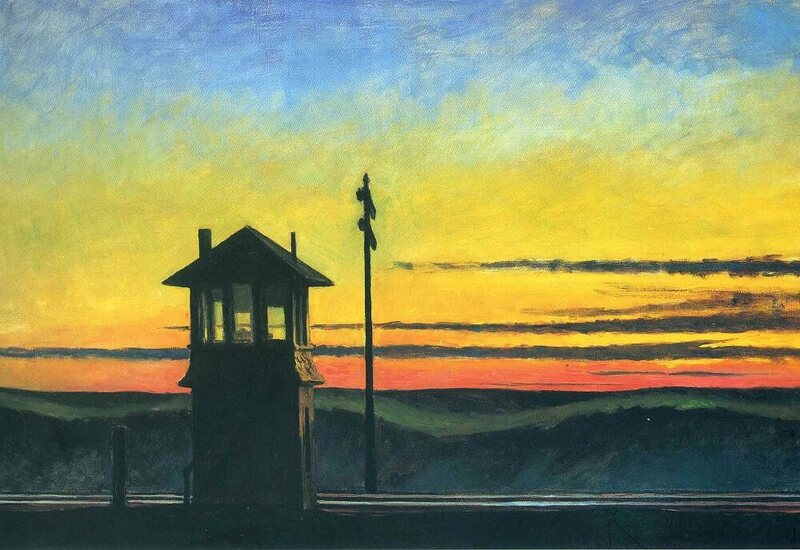 Although he created grand and generous physical spaces, such as that of Railroad Sunset, Hopper often declined to fill them with specific objects and incidents. 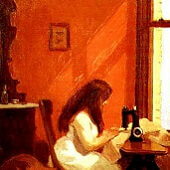 They are open to the activities of memory and personal reverie. They provide a place where the artist's voice can be heard alongside our own. 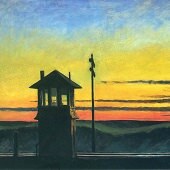 In the clearly stated, light-filled structures of Railroad Sunset, Hopper speaks about the solitary journey of the traveler in the oceanic sprawl of this vast country.